Finally Fashion suits political policy. 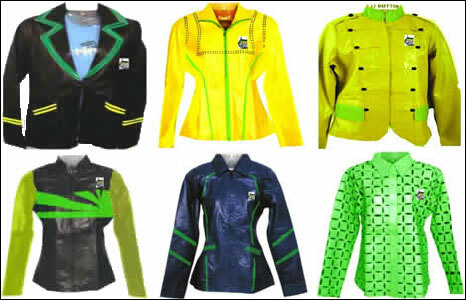 While browsing the BBC News website this morning I came across something rather amusing, an article about the new ANC (South Africa’s Ruling Party) leather jackets that were on sale. While matters of fashion don’t particularly interest me I decided to take a quick look and discovered these monstrosities. So if you’ve just passed your CCIE, you want to make a statement, be seen (day or night) or just start a new part-time job as a runway beacon at the local airport go on over to http://www.anc.org.za/show.php?doc=pbf/forms/order.html and get yours now! A small sample of the errr... interesting garments on sale. Well done packetlife.net for providing the networking community with such a great resource! I came across a rather interesting video on youtube today, regarding the Cisco NERV. Communications are always vital. During natural and other disasters, however, they become an absolute necessity. Cisco is in the IP communications business and identified a need for a ready-to-go, plug-in solution for command center communications during emergencies. The outcome: The Network Emergency Response Vehicle (NERV). Basically, a mobile communications vehicle that can act as a command center for your on-the-ground disaster management, as well as a central processing center for all the communications going on for that effort. -blogs.cisco.com To read the rest of this article please click here. As many small branch office/head office LANs are deployed, IT departments make the decision to build a pure Layer-2 LAN network. This is often done for many reasons such as reducing network complexity, reducing equipment cost, as a result of limited in house skills to deploy Layer-3 devices, etc. This design tends to scale quite nicely until the IT department is faced with certain challenges including, wanting to segment the LAN into various broadcast domains as broadcast traffic has begun to affect network performance, the ability to filter Inter-VLAN traffic without having access to the networks Layer-3 devices and the desire to add and remove new VLANs and facilitate Inter-VLAN routing without the involvement of their ISP (who typically controls the sites CE routers in the majority of MPLS VPN deployments). In this post I would like to introduce the following scenario and in later posts we can discuss the proposed network design and migration strategy. The ACME Corp Head office in Johannesburg South Africa originally started off as a small 30 host LAN. Over the two years their LAN has grown to well over 400 hosts, including servers, printers, end-user workstations and more. Broadcast Packets, particularly from their server farm have started to affect overall LAN performance. The ACME IT Department require the ability to easily filter Inter-VLAN and Intra-VLAN traffic without involving their ISP. A large Amount of Inter-VLAN traffic is expected. The ACME IT Department require a clear demarcation point between their LAN and their ISP, so that faults can be quickly isolated to either the ISP CE device and/or WAN or the ACME LAN. The ACME IT Department require the ability to migrate hosts to new VLANs within their own timeframe with minimal involvement from their ISP. The site currently has two ISP managed CE devices, a 2801 terminating a 1984k leased line and a Cisco 877 terminating a 4096k ADSL backup link. Currently the network is utilizing Cisco 3560 switches used in and Collapsed Core and Cisco 2960 Switches used in the access layer. In part I of this post we have established the clients requirements, in the next post we will explore the current configuration on the clients equipment and propose a new design and migration strategy…. 1) The National Programme on Technology Enhanced Learning, Youtube Channel http://www.youtube.com/user/nptelhrd ] offers an outstanding array of lectures, covering everything from SONET/SDH and ATM networking to electrical and civil engineering topics. Personally I was left wishing The National Programme on Technology Enhanced Learning had provided a reading list for each of the courses on its Youtube channel. This would allow those who wish to expand their knowledge of particular topics to do so much more easily. 2) The MIT Open Courseware website offers Free lecture notes, exams, and videos from MIT with no registration required. Of particular interest were the Electrical Engineering and Computer Science pages, which can be found at [ http://ocw.mit.edu/OcwWeb/web/courses/courses/index.htm#ElectricalEngineeringandComputerScience ]. If you’ve come across any freely availible Telecommunications Engineering training material, please let me know. I’m sure many of the readers of such a blog would be interested. What a year! After not blogging on my site for over a year, its great to be back. 2009 has been an absolutely amazing year and I’ve been fortunate enough to meet some wonderful people, be a part of some exciting projects and learn a lot. For the past 13 months I’ve been involved in network design, rollouts, maintenance and troubleshooting of various large enterprise networks, primarily assisting with the migration of these networks from another service provider to our network. I’ve had the opportunity to watch design become reality, turn problems into solutions and learn a lot about networking, security, VOIP and more. The majority of these networks have been between 50 and 300 site MPLS VPN networks, where my work has included anything from CE router cconfiguration, MPLS PE router configuration, routing within Client VRF’s, Hosting Enviroment onfiguration, Firewall Configuration, Third-Party connectivity VRF’s, Network Design, Establishing Migration strategies, Layer-2 and Layer-3 switch configuration, as well as a healthy dash of BGP and QoS. As a result of being rather busy at work, my CCIE studies have had to take a back seat in 2009. I am however hoping to resume my studies early next year, possibly with the goal of attempting the written exam and lab before the end of 2010. I’ve also decided to broaden the focus of my blog, including more posts related to topics such as photography, politics and technology in general. I thought I would leave you with, what can best be described as one of the most valuable lectures you will ever witness. Its not related to networking, but rather something far more important…. Its been quite a while since I’ve had time to post on my blog, so many things have happened lately and a lot has changed in my life. As a result my CCIE lab prep has gone through somewhat of a rut. Firstly I think many people go through a short period after completing their CCIE written exam where they are unsure of what exactly their next step should be. Fair enough I guess my “short” period may have lasted longer than others, but I now have a plan and as of Monday I will be starting to work on my lab prep again. I will spend the next month in refresh-mode, going over the OECG, reading Cisco Documentation and maybe reading a book or two from the recommended reading list. After that I will officially start The Internetwork Expert End-to-End Routing & Switching Program and/or The IPexpert Self-Study Blended Learning Solution. Ideally I would like to work through both vendors programs as I believe it would expose me to as many obscure and interesting scenarios as possible and thus increase the probability of me passing my lab on the first attempt. The only issue with working through both vendors learning solutions is cost, at about 5k USD for both, its pretty steep. Speaking of steep, this week I started my new job at a Tier-1 Internet Service Provider here in South Africa. Its an excellent opportunity to not only further my career but to learn more about routing, switching, security and so much more. Though having never worked for a large ISP, its going to be a steep learning curve getting used to the way certain things are done. I’ve really enjoyed my first week and I’m certain that I will enjoy working for such an innovative company. It’s great being able to go to work in the morning, knowing that you’re going to hear nothing but discussions regarding routing, switching and coffee. How will this new position effect my Lab prep? Well I plan on getting to work at 5:30 each morning, I will then get 2 hours study in before starting work. Ideally I would like to study more, but I think that for the next few months, while I’m having to study other work related technologies/applications, etc 2 hours is a fair amount for weekdays. Saturdays and Sundays will then become my Lab days, this is when I will be working through my workbooks, spending as much time as possible studying on these two days. All round, I think that getting my CCIE has become harder, as starting a new job is bound to take up loads of my free time, but I am motivated to pass my lab and get my CCIE. I know what I want, and I have a plan detailing how I will go about getting it. I just need to remember something I realized when I was studying for my first ever industry cert (Comptia Linux+)… Its not about a lot of hard work all at once, its about a little bit of work every single day.